Amazon offers multiple student discounts, the most popular being a 6-month free trial of Prime followed by 50% off. In addition to Prime membership, Amazon also offers exclusive deals to college students and up to 90% off textbooks. 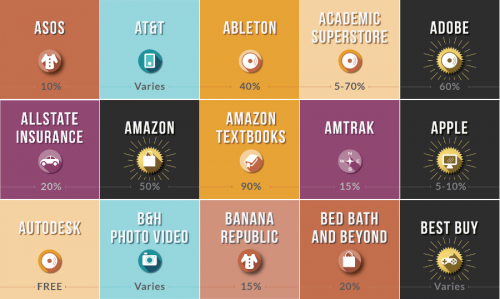 What does Amazon offer for student discounts? Amazon is a big retailer, so it’s appropriate that they are also the big kahuna of student discounts. Nobody beats Amazon student deals. The discounts broadly fall under 3 categories. 1. Free Amazon Student Prime, plus 50% off. Claiming your free Amazon Student Prime is a no-brainer if you’re a student. If nothing else, claim the 6 months of free membership, then cancel if you like. But chances are, you’ll want to take advantage of the 50% off Student Prime membership when your free trial ends. What’s so great about Student Prime? Famous and free 2-day shipping on over 50 million items. Once you switch to free 2-day shipping, you’ll never go back. Free video streaming. Amazon has a huge catalog of digital TV, movies, and originals. Literally thousands of titles are included in Prime. Premium shows are usually available for purchase. Free Kindle downloads. Your membership includes Prime Reading, which includes thousands of books and magazines. Again, premium content is available for purchase, but why not check out the free stuff first? Free unlimited photo storage. There are a lot of photo storage services out there, and Amazon ranks with the best of them. 2. College Deals and Prime Student Coupons. Your Amazon Student Prime membership gets you access to exclusive college deals, such as $5 off Soylent (it changes every week.) You also get access to exclusive Prime Student Coupons for deals on everyday purchases. 3. Amazon Textbook deals. Amazon is one of the largest textbook sellers in the world. They leverage their buying power to provide new and used textbooks at up to 90% off published prices. They also have one of the most streamlined book buyback flows in the business. So when you’re done with your textbooks, it’s easy to get cash back. Create or log in to your Amazon account, then join Amazon Student Prime. You’ll need to provide a valid .edu email address and provide some basic information about your school and major. You’ll also need to provide a credit card to pay for any purchases. If you already have an existing Prime membership, it will be converted to Student Prime. Be careful, as Student Prime has a couple of restrictions. See below. If your parents are paying for your current Prime membership, or if you are a guest on their account, you can usually switch the account over to you as long as you have a .edu address. This way your family only pays 50% the cost of a membership while you’re in school. Keep in mind that while existing guests on a membership remain guests and keep free shipping benefits, new guest cannot be added to Student Prime. The other downside to this approach is that Student Prime memberships do not have access to Prime Music or Kindle Owner’s Lending Library. This is truly the best student discount in the world.